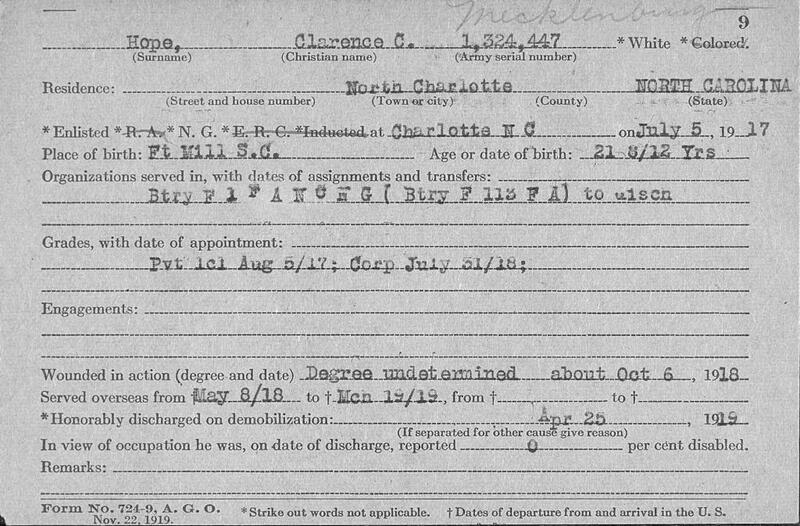 The Military Collection at the State Archives of North Carolina is excited to announce the availability online of a newly-digitized 1980 self-interview by World War I veteran Clarence C. Hope Sr. of Charlotte, N.C. Recorded at the request of his daughter, the interview last 59 minutes, and recounts the full details of his war experiences in Battery F, 113th Field Artillery, 30th Division, U.S. Army, during the war. This is one of 34 WWI veterans interviews held by the State Archives. Clarence C. Hope was born on October 17, 1895, in the town of Fort Mill in York County, S.C., to Martin Luther and Della Louise Ritch Hope. Clarence's father was working as a weaver at a cotton mill in York County by 1900. By World War I, the Hope family had moved to Charlotte, N.C., and Clarence was working as a stock clerk at the Charlotte Depot. Clarence Hope applied for service in World War I in the U.S. Marine Corps recruiting office in June 1918, and was rejected because he was underweight. Then he went to the U.S. Navy recruiting office, as well as the offices for the U.S. Army and North Carolina National Guard--but was rejected for all of these because of being underweight. The National Guard was moving to their training camp, and allowed Hope to come with them to weigh him. If he showed he could gain weight, the National Guard agreed to take him on a provisional status. Hope gained 1.5 pounds that allowed him to be registered with the North Carolina National Guard on July 5, 1917. He was assigned to Battery F, 1st Field Artillery. When the National Guard was federalized for the U.S. Army in WWI, Hope was assigned as a Private First Class to Battery F, 113th Field Artillery, 30th Division, U.S. Army. Hope served overseas in Europe during WWI from May 8, 1918, when his unit left the United States by troop transport ship, to March 19, 1919, when he returned to the United States from France. Hope was promoted to the rank of Corporal on July 31, 1918. He was wounded in action in France on October 6, 1918. According to Hope, he was also exposed to chemical gas, and suffered ill effects from it for a period. Hope was honorably discharged by active U.S. Army service on April 25, 1919. After the war, Clarence Hope returned to Charlotte and married Margaret B. Kidd on May 7, 1919. By 1920, the Hopes were living in Charlotte, where Clarence was the proprietor of a tailor shop. By 1930, Hope was working as a salesman for a roofing company in Charlotte. At the height of the Great Depression by 1936, Hope was working as a clerk for the Standard Oil Company in Charlotte. He remained with Standard Oil as a bookkeeper by 1940. Clarence C. Hope Sr. died on July 30, 1986, in Charlotte, N.C., and was buried in Forest Lawn West Cemetery in the same city. You can listen to the full streaming-only interview online in the State Archives of North Carolina's Internet Archive audio page: https://archive.org/details/MilcollOH1133HopeSr. Copies of the interview can be ordered through the State Archives' digital duplication regulations.